One, the mural could be restored at great expense as the damage was quit severe. Two, have a reproduction painted of the mural. The parish chose to look into having a reproduction painted. They contacted several muralist to bid on the project. 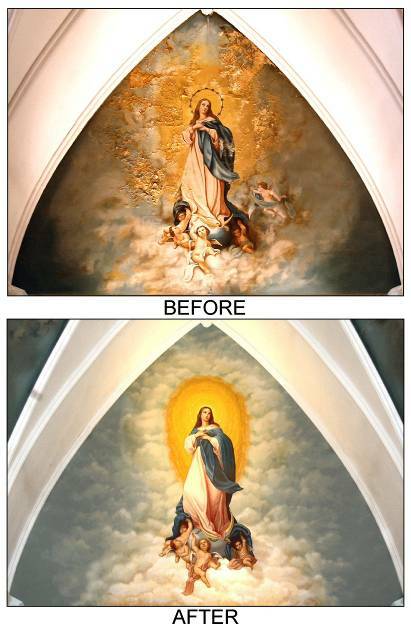 After being awarded the project the parish and I worked together to recreate the 13’ x 18’ mural. I painted the mural on canvas in my studio (two separate panels), emailing images of my progress and making the changes the parish asked for. Once the canvases were complete I traveled to Hamilton, NY and installed the mural.